The party season is nearly upon us, so before it’s too late, get your hands on the best value New Year’s party package in the city. 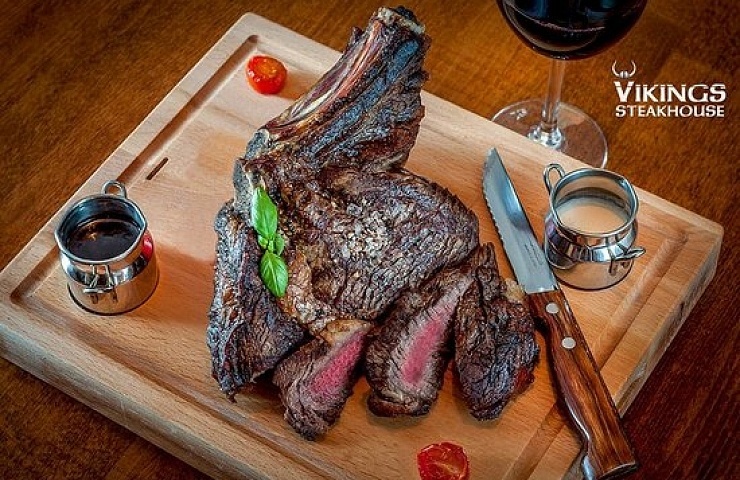 Clontarf’s Vikings Steakhouse have just made their Viking Meat Feast even more irresistible. Now you and up to 17 of your carnivorous chums will have the chance to spend the evening feasting on the finest Irish Beef, the juiciest Pork, and the tenderest Lamb and Venison, and a save a whopping 42% while doing so. What’s more, booking online will see each guest receive a cocktail on arrival, and 30% off selected wines. That sort of saving is welcome at anytime of the year, but never more so then during the festive season. Best of all, with a deal like this, you can afford to do it all again the next night…if you think you can handle it! Furthermore, you’ll get to meet the genius behind this tantalising menu, Head Chef Andy Byrne, who is also known as the Viking God of Meat! Tables for 12-18 are available for reservation now, with party packages starting at €480 for a group of 12 (including 42% discount.) New Year’s Eve reservations are also available for €69 per person.